The Final Mass Building Bible You&apos;ll Ever Need to Build Lean, Hard Muscle! A lot of bodybuilders just look like fat guys with really big forearms in the offseason. The quest for MASS has led many bodybuilders into the trap of gaining so much FAT that by the time they drop the fat to expose their newly developed muscle, they have been dieting so hard and so long that they LOSE most of that precious LEAN BODY MASS (LBM)! OH NO! What do we do? How can we gain Lean Mass and keep fat gains to a minimum? Can we gain as much LBM without packing on slabs of bacon on our inner thighs? If these questions are running through your MASS-HUNGRY dome, no more. Team Scivation, led by the Cut Diet creator Chuck Rudolph, has devised a game plan to not only make you bigger and more muscular than you ever imagined possible, but they also will present in the very pages of this book a method that is scientifically backed and real-world proven to keep the fat gains to a bare minimum while fueling your body for one primary goal - EXTREME MUSCLE GROWTH! Don&apos;t wait any longer. 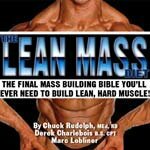 Drop everything you&apos;re doing right now and dive into this Holy Grail of Mass that not only will serve as a reference guide, or bible for how to eat, but also make you big, hard and jacked beyond belief. Grab a fork and put on your reading glasses, Team Scivation is about to take you on the mass gaining ride of your life! In his latest competition at the Heart of Texas, Scivation president Marc Lobliner took 1st in the Lightweight Open Class.